Montgomery – Philip Shelton of Decatur has been named the 2011 Remodeler of the Year by the Home Builders Association of Alabama (HBAA). The award was presented at the HBAA’s 2011 Convention awards banquet on October 28 at the Embassy Suites in Huntsville. Shelton, the owner of Shelton Construction, Inc., served as president of the Greater Morgan County Builders Association (GMCBA) from 2004 through 2007, and has been a board member for the past 10 years. He has been active in the HBAA Remodelers for the past eight years, serving as chairman of the HBAA Remodelers in 2011. Shelton has earned several professional designations through the National Association of Home Builders’ Home Builders Institute, including Certified Graduate Remodeler, Graduate Master Builder, Certified Graduate Builder, Certified Aging-in-Place Specialist, and Certified Graduate Associate. He has also earned certifications through HBAA, including Energy Key Builder, Certified Lead Paint Renovator, Qualified Credentialed Inspector, and Certified Weatherization Contractor. As a competitor in the Alabama Remodeling Excellence Awards program, Shelton has won nine first-place awards and the overall Best in Show award. In 2009, he won the Chrysalis Award for Best Commercial Remodel in the Southeastern Region of the U.S. 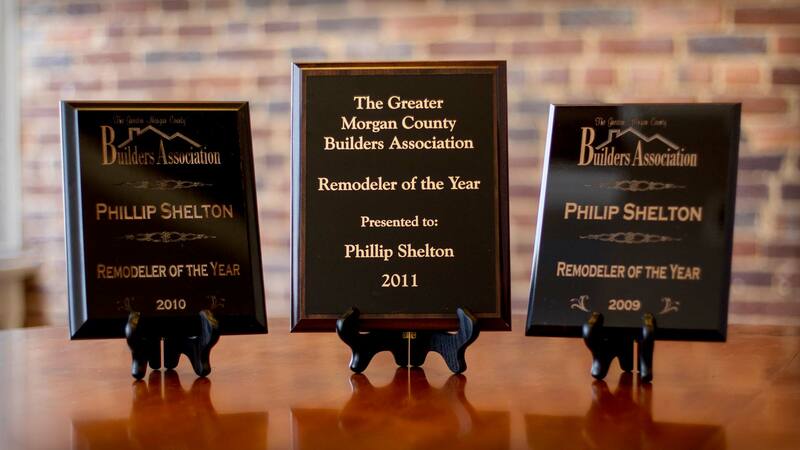 In 2009, 2010 and 2011, he was named the GMCBA Remodeler of the Year. For more information about the Home Builders Association of Alabama, contact the HBAA at (800) 745-4222, or visit www.hbaa.org.